Side profile....isnt is so pretty? I love it....First attempt at a bigger one using this die so it ain't perfect! Ello Ello ma Petite Loopy Loo's. Ohhhhh get me and me French!! But there is a reason for it ..... of course! Ive decided if you say this flower with the proper French accent, the "cabbage" part sounds so much more romantic and appealing. Go on....give it a try....."Cabbaaaaagggge Rose".... See, sounds so much better. Oh I so have you lot repeating that now, havent I?! Heehee. Ive been a bit of a boldie and a lazy bumhead (I know....strange expression but if you know me at all by now...its pretty much the norm. Plus its a nickname I call my sister, one of many I might add. I really have to re-evaluate my nicknames for my sibling. First Mi-Wadi, now Bumhead...you dont want to know the rest!). Rather than do a photographic tutorial and a video tutorial as back up.......Ive been very lazy and just did the video tutorial......Please forgive me!! But there is a reasonable explanation for this other than my sheer laziness which was undoubtedly a factor. 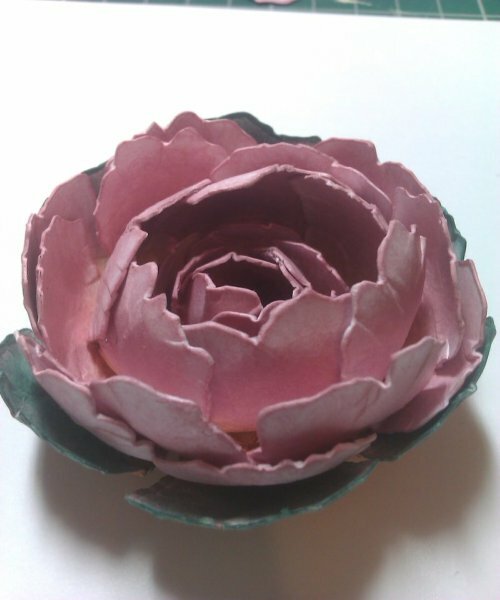 The other reason is because I did do this tutorial before ...... just have a look in the sidebar for the small cabbage rose. So I decided to have a go at making a bigger one using 300gsm cardstock, distress inks (of course) and my Tim Holtz Tattered Florals Die. For the actual flower itself, you will need 3 cuts of the largest flower from the die and 2 of the second smallest flower from the die. I also wanted to add leaves to my cabbage rose so if you want to do this, cut an extra large flower. So without further ado.....here we go....Ohhh theres no talking again because again it was very late or very early depending on what way you see it!! But to the beautiful voice of Tyler Swift is much nicer to listen to than listening to my fine Northern Ireland accent. Ohhh I could always sing to you in my accent! No? Heeeyyyy! I can sing! Please excuse the glue ALL over my fingers, knuckles, inky nails, glued hands.....Im a messy pup! PS Youtube puts an advert up on the screen.....not my doing......but there is a wee "x" on the top right of the advert to take it off the screen. And thats it from me again folks. Dont forget if you want the tutorial with the photos, have a look in my tutorials list and the Small Cabbage Rose is there. Any questions....give me a shout. Thanks for watching. Stunning luv that shade of pink and great choice of music, I was gonna leave a message on my answering machine until I heard it, deleted it. Flowers are gorgeous! I want to see the vid, but have to wait for tomorrow for Tom to crawl under my desk and attach an audio lead to the PC (wonder if I can get him to look for that missing Tim Holtz arrow stamp while he's down there LOL!). These are fabulous Lee, and thanks for another fab tutorial, I kind of like the name cabbage rose because it sounds a bit funny, but maybe that's just being a bit odd. Your names for your sibblings really made me smile, My younger sister used to call everybody bumhead when she was younger, but now that she has grown up and got kids of her own she normally calls me "a noodle" but then we all called her moosepig when she was little so I think she is with in her rights lol. It becomes like a term of endearment with large families, my younger brother also got called radish for years (which he hated). Wow these flowers are gorgeous!!!!! Wow thanks again for the wonderful tutorial!!!!! Way to go my friend!!!! Fab Tute Lee though I quite like the idea of you singing to us while your working away lol! The rose is amazing as is EVERYTHING you make! I had to laugh at myself though, I was 7 minutes into watching before I realised I could close the adverts that were in the way! I don't thinks that video tutorial represents your laziness, sweet heart :) Have a great day and many thanks for sharing this tuto! Not got that Tim Holtz die yet will have to look into getting one so I can have a go. 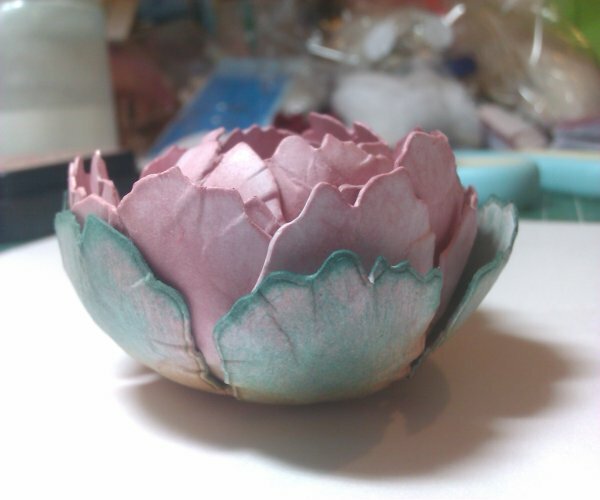 Wow Lee..... that is a fabulous cabbage rose, and a BRILLIANT tutorial! Now... I'm really going to have to invest in a hot glue gun.... can you recommend the one that you use? It looks so fine tipped! Email me? These are beautiful Lee, Fab video tutorial too. I've been having a flower making session today! Complete with burnt fingers too! You'd be proud! Oh wow Lee, this is truly a totally pretty pretty rose! Love your use of that die and you've made such a fab tutorial as well, thanks for sharing!! Lee these are b'ful! Thanks for sharing the video tutorial..
Hi Lee, ooh! I soooo enjoy reading your posts hun. They do make me chuckle. Another amazing flower and your tut is absolutely fantastic. Hi Lee, beautiful flower!! !thanks for sharing, tutorial!! I don't see how making a video is "lazy". I think you did a great job! gorgeous music too, who is the artist?